An oven-roasted Thanksgiving turkey is a hallmark of the November holiday. Who doesn’t have a mental image of loved one pulling a heavenly-smelling turkey out of the oven? With so many side dishes to cook up —baked mac n’ cheese, sweet potato casserole, green bean casserole, and more — sometimes it’s like playing Tetris trying to fit the turkey in the oven and while cooking your sides. 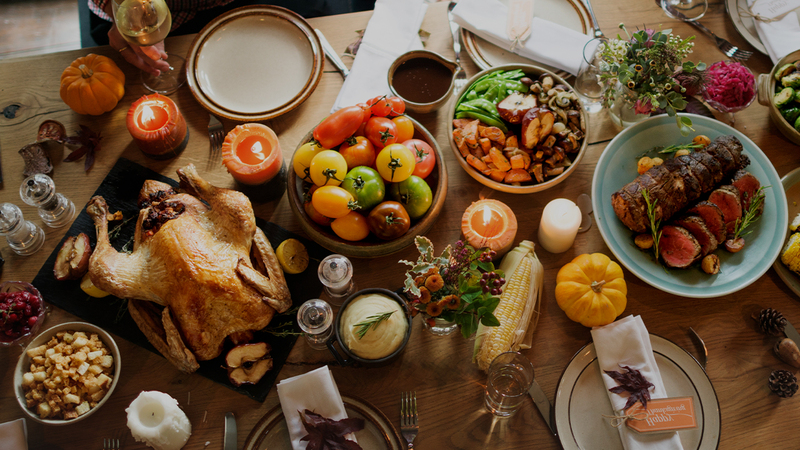 This guide delves into five different ways to prepare your Thanksgiving turkey this holiday, ranging from traditional to a bit more adventurous. Roasting a bird in the oven is certainly an option, but it’s not the only option. Read on to learn how to grill, smoke, deep fry, and even cook your Thanksgiving turkey in a crockpot! The most traditional way to prepare a turkey, this Thanksgiving turkey with apple cider brine recipe calls for brining the bird the night before and roasting it in the oven. It does offer some variation from the typical turkey preparation with its apple cider-based brine, chock full of herbs and aromatics like garlic, rosemary, bay leaf, thyme, and sage. Maple syrup adds a hint of sweetness to the brine as well. Fill the turkey cavity with onion, orange, and aromatics and then truss the bird (essentially, tie it closed). You can line the roasting pan with the turkey neck, along with onion, orange, and herbs, to impart more flavor. Fill your roasting pan with chicken stock. Place the bird breast-side-up onto the roasting rack, then put it in the oven for 20 minutes. Lower the temperature to 325°F, and cover your turkey loosely with foil. Roast the turkey until it reads 165°F on a meat thermometer; this is typically around 20 minutes per pound of turkey, but that, of course, can vary. Lastly, be sure to let it rest for at least 30 minutes for a nice evenly cooked bird! If you’re looking to cook a smaller turkey this Thanksgiving, the crockpot is actually a handy holiday tool. This crispy skin slow cooker turkey looks and tastes as though it was oven-roasted, but it was actually cooked up in a crockpot! In fact, slow cooking a turkey is the ideal way to get juicy, succulent, and moist meat. While you’ll need your oven in the last 10 minutes to broil the skin to a crisp, the crockpot handles this turkey for four to five hours — freeing up your oven for all your yummy side dishes. You’ll need a smaller turkey — around eight pounds or so — to fit in a large crockpot, which makes this method perfect for smaller Thanksgiving gatherings. It’s also super unfussy, meaning you’ll have plenty of time to spend with your guests. Simply pat your bird dry, slather it in herb butter (reserve half the butter for later), and place it atop an arrangement of garlic, lemon slices, and herbs in the crockpot. Cook it on low for eight hours, or high for four to five hours. In the last half hour, preheat your broiler. Slather the rest of the herb butter on the warm turkey, then broil the skin to a crisp in the oven. It should take about 10 minutes. The crockpot method still leaves you with unctuous pan drippings, perfect for whipping up a quick, creamy gravy. Smoked turkey is an intensely flavorful alternative to the roasted turkey central to most Thanksgiving spreads. This smoked whole turkey recipe sticks to the basics, simply brushing the turkey with oil and sprinkling it liberally with salt and pepper. You don’t need a ton of flavor elements like herbs and aromatics, because the wood chips (hickory, pecan, or apple wood work best here) impart a rich, smoky flavor all on their own. The bird does get basted with a mixture of chicken stock, honey, and apple cider vinegar for sweet tang. To start, soak your wood chips in cold water for at least four hours. Prepare your smoker or a charcoal grill for indirect heat, approximately 275°F. Char your wood chips before cooking the bird. Place your turkey in a roasting pan with a rack. Brush it with oil and sprinkle salt and pepper all over. Place the turkey in the grill or smoker for 45 minutes, then baste it with the chicken stock, honey, and apple cider vinegar mixture. Repeat every 45 minutes, until the bird reaches 165°F. Deep frying a turkey might have a bit of a dangerous reputation, but if you’re safe and smart, it’s the perfect way to crispy-skinned and moist turkey. This deep-fried turkey with herbs is also a speedy turkey to whip up: It takes less than two hours from start to finish. To deep fry a turkey, you’ll need to invest in some equipment. You can buy a turkey frying kit, which should include a very large aluminum pot, a propane burner, a poultry rack with a hook, and a deep-frying thermometer. You’ll also need a full propane tank, a waterproof marker, an apron, heavy-duty, long oven mitts, a meat thermometer, and a fire extinguisher — just in case. There are many steps to frying a bird, but they’re mostly just safety checks and simple, easy-to-follow actions. Be sure to read a deep-frying recipe, like the one above, thoroughly before starting the process. If you live in a year-round warm climate or are blessed with decent outdoor weather this Thanksgiving, the grill offers a great place to cook up your turkey while freeing up your oven for side dishes — baked mac n’ cheese, anyone? This grill-roasted turkey recipe is foolproof. You will need a grill, of course, as well as a charcoal chimney and some soaked wood chips if you’d like to add more flavor. All this turkey needs is some apple, orange, onion, butter, salt, pepper, and, of course, indirect heat. Simply start your grill with the charcoal chimney, and place an aluminum pan with two cups of water in the grill. Place the grate over the coals and pan. Pat your turkey dry with paper towels (are you noticing a recurring theme with this step?). Place your apple, orange, and onion in the cavity, and rub the bird inside and out with butter. Season with salt and pepper. Place the turkey on the grate over the pan (never the coals) and cover the grill. Try to keep the internal temperature around 350°F. Rotate the turkey every hour for even browning, again, until the bird reads 165°F.